Stock photo of the Toronto Skyline against a bright blue sky as seen from Ontario Place, Toronto, Lake Ontario, Ontario, Canada. 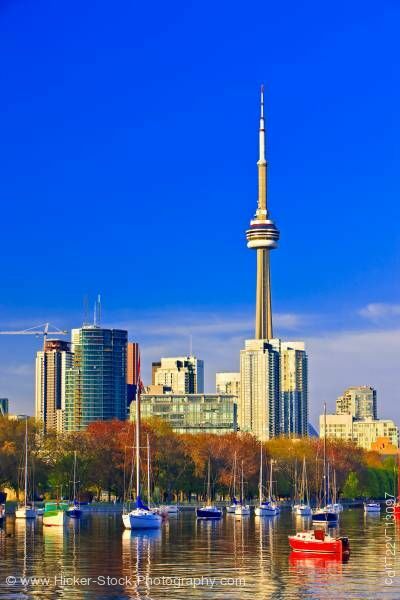 This stock photo outlines the City of Toronto's skyline against a bright blue sky as seen from Ontario Place in, Toronto, Lake Ontario, Ontario, Canada. From its beautiful harbour front to its lively downtown core, Toronto is one of the most beautiful cities in Canada to visit. Toronto has some of the most vibrant and lively tourist spots in Ontario. As Canada's economic capital, Toronto is considered a global city and is one of the top financial centres in the world. Toronto's leading economic sectors include finance, business services, telecommunications, aerospace, transportation, media, arts, film, television production, publishing, software production, medical research, education, tourism and sports industries. The Toronto Stock Exchange, the world's seventh largest, is headquartered in the city, along with a majority of Canada's corporations. Toronto's population is cosmopolitan and international, reflecting its role as an important destination for immigrants to Canada. Toronto is one of the world's most diverse cities by percentage of non-native-born residents, as about 49% of the population were born outside of Canada. Because of the city's low crime rates, clean environment, high standard of living, and friendlier attitudes to diversity, Toronto is consistently rated as one of the world's most livable cities by the Economist Intelligence Unit and the Mercer Quality of Living Survey. Residents of Toronto are called Torontonians.